How's everyone doing? 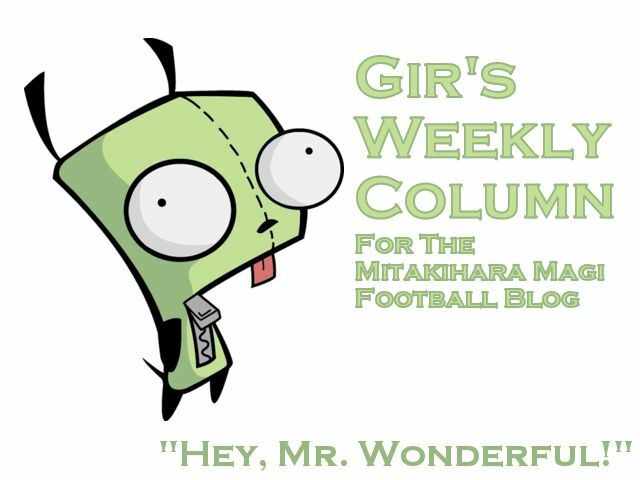 It's Gir Todafunk with another weekly column for the Daily Magi and Mitakihara Magi Blog. I love you all. No really, I do. I mean it, with all my heart and soul. Yes. So here we are, would you believe it. The eve of kickoff in the Meadowlands. MetLife Stadium in East Rutherford, New Jersey. The coaching staff likes our team to stay in luxury, while at the same time stretching the budget. We're staying at the Sonesta ES Suites Parsippany where there is a Wi-Fi connection so I can actually blog this to you all at no charge. The great thing about this hotel is that it's also far away from New York City. If we were staying at Waldorf Astoria, we'd not only have to pay for the Internet, but the press would be all over us. We did our training this week at Parsippany High, then we did a runthrough at MetLife Stadium before returning to the hotel. I just got back from a tutoring session on Introduction to Prose Genres. Not like I want to, but if I want to, it's required. And that's the thing. I always have to keep in mind that I'm a student, first and foremost. I graduated in the top 3% of my third-year class last year and earned all-Academic honors that same year, so I know that I have to internalize the concepts that my professors give me. The great thing about this is that many of the courses are online, and we can communicate to the professors live and in person through our laptops. All of the sports teams like to take part in online classes because they have to travel to games, but they want to feel like they are still on campus. It's so awesome. It's very convenient. I'm surprising calm. I'm not nervous. I just have a feeling that my team, the Mitakihara Magi, are going to humiliate Texas A&M. Humiliating opponents and delivering the feels to them is something that is old hat for the football team. I know it because I am used to seeing these sorts of events occur. Recently, last year, the football team has been regressing in form, and at home, the victories are more subtle and normal. On the road, it's different. You see the usual run-it-up style from the Magi, but at home, they give way too much respect to their opponents. We've actually had quite a few close games. Maybe the football gods want us to be a show a little bit more hospitality to our guests. Maybe because this is Canada and the people are supposed to be a bit nicer. Well, we're so similar to our neighbors to a degree that we might as well be the 51st State. On second thought, us Canadians are fine bowing down to His Majesty King George VII. His Majesty's son, Prince Albert, is currently attending Eton School and is considering earning his A-Level here at Mitakihara instead of Oxford or Cambridge. We've had a lot of royalty attend Mitakihara before, so one more couldn't hurt, right? Right? Right. So with that said, I'm going to go ahead and get some shuteye and prepare for tomorrow. See you next week for another of my columns. (Rule, Brittania! Brittania, rule the waves...) Til then, this is Gir, signing off. You Are Not Alone.